The Ramblings of an Endurance Junkie: Xterra Worlds 2015 Countdown: 1 day to go.....It's Time! Xterra Worlds 2015 Countdown: 1 day to go.....It's Time! Saturday and just one day to go! An easy day on the books today started with Sarah and Dad running the Kapalua 10km trail race over the same course as the World Championship course. It was awesome to watch Sarah race as I hadn't done that before (She raced earlier this year at Richmond but I ran with her) and it is actually quite emotional to watch....I think the fact that it was at the World Championships added to the whole effect including the cannon start! We knew it was a tough course including a 3 mile climb, obstacles and a final beach run totaling 1200ft of climbing in just 6 miles! Sarah did great though, beat Dad by a few minutes with a 1hr 27mins finishing time and importantly a smile as well! 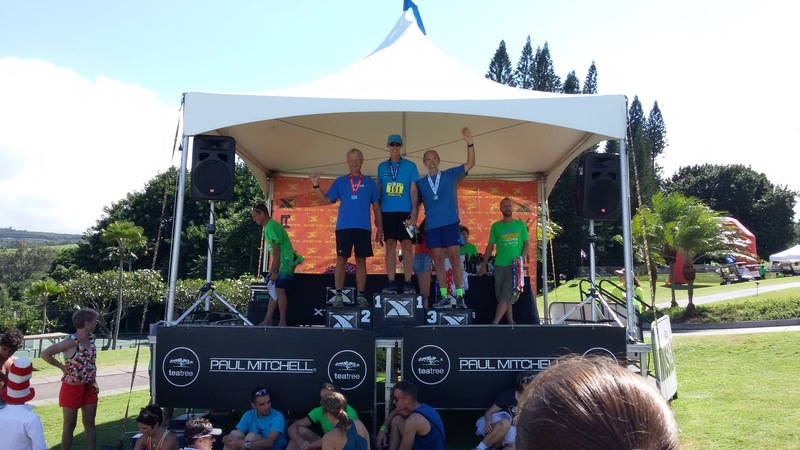 Dad ended up in 3rd in the 6X-6X age group (numbers x-ed to protect the innocent). The rest of the day was spent chilling, hydrating and attending the pre-race briefing. Very uneventful to be honest and something needed to rest the body and mind ahead of what will be a demanding day both emotional and physically. The course is a doozy and has to be treated with a lot of respect. The course conditions as well as weather conditions can quickly turn the day into something horrid and the key for me is to really enjoy this experience while racing to my potential. If that means taking it easier during certain portions of the race then so be it.....just from watching the 5km and 10km trail race today there were plenty of people that didn't respect the conditions enough and paid for it.